One of Cardiff’s most popular parts is Cardiff Bay, but unfortunately we didn’t really have the ideal weather for it! As soon as we got there we made a stop off at Bills for breakfast and then had a stroll round. The Bay is home to a few restaurants (nice but quite chainy), along with the Millenium Centre, the Norwegian Church (where Roald Dahl used to come as a child) and a huge Dr Who exhibition. On a nicer day, I may have felt a little bit differently but although I liked the bay, I wasn’t blown away by what is often people’s favourite part of the city. If the sun is shining, I would definitely recommend grabbing a huge ice cream and wandering around but if the weather is a bit miserable, I wouldn’t put it at the top off your itinerary. After dropping our bags off at the hotel (more on that later!) we headed out to the city centre to take a look at some of the shops. Cardiff boasts a range of shops including all of the highstreet favourites in a really nice centre called St David’s Dewi Sant and some more quirky type offerings. Branching off from the main street is a number of little arcades with boutiques selling clothes, interiors and gifts and trinkets – right up my street! One place not to miss is an ice cream parlour called Science Cream where they use liquid nitrogen to create the smoothest, creamiest ice cream around. After we were all shopped out we headed to a little cocktail bar called Apple Jacks to grab a drink in the sun, which had now well and truly appeared! If there is one thing I love it’s street food so when I heard that there was a market taking place the weekend we were there I knew that was our evening sorted. Street Food Circus is a market that takes place every Friday, Saturday and Sunday in May and June and it’s made up of a whole host of vendors serving a range of cuisines such as indian, greek and american sloppy fries! In the middle of the market is a huge circus tent with bars on either side and rows of benches for people to sit and enjoy their grub. When we arrived there was an amazing reggae band playing so we grabbed a Singha beer and took a seat right at the front. The market had the best chilled out vibe and although we left it a bit late to get food (everything was nearly sold out – rookie error!) the food we did get was delish – if you ever head to Cardiff in the spring, this is a must! The castle itself isn’t massive and is relatively cheap entry at £12 for one adult. It’s nice to walk around on a sunny morning and has some really cool gothic style buildings including the tunnels where people would take cover from the WW2 bombs and the library of my dreams! Before we headed home, there was just enough time for a pitstop at the cutest oldy worldy coffee shop I had spotted the day before. Found in Highstreet Arcade, Barker Tea House is a tea specialist with every blend and type you can think of. I opted for a loose leaf Assam and a healthy slice of millionaire shortbread and Will devoured a cheese and chutney panini with an English Breakfast. For our trip we stayed in The Royal Hotel*, which is right on the highstreet. The location was perfect and with rooms as cheap as £40 a night it’s super good value too. If you are looking for luxury then this might not be the best best, but for somewhere comfortable and central to rest your head, we couldn’t fault it. If you fancy yourself as a bit of a deal finder, you can also book the room through RoomAuction.com a site where you can make an offer lower than the standard room rate when you are booking last minute or in off-peak times. 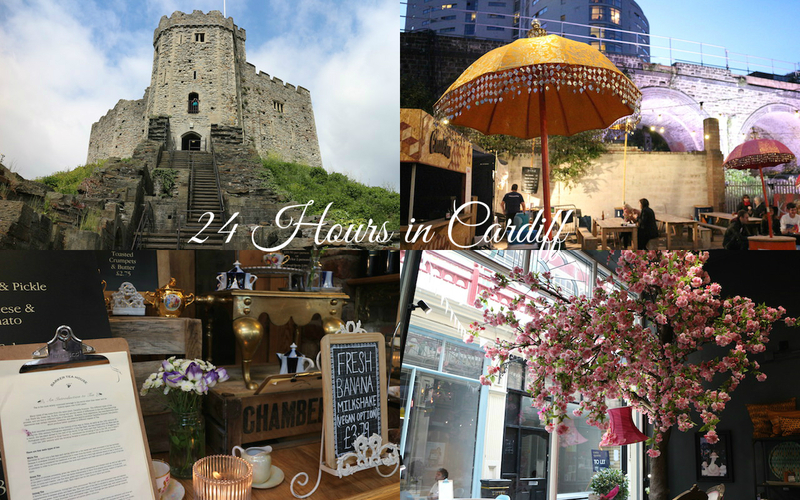 So that was our 24 hours in Cardiff, if you are looking for somewhere a bit different to head for a night away, I would definitely recommend it. What do you think of our suggestions? Have you ever been? *Our stay was given to us complimentary by Room Auction, however all views stated are my own.